I remember years ago when I first decided to trade stocks. I looked at a few charts and thought: How hard can this possibly be? I will buy stocks when they're going up, and sell - or short sell - stocks that are going down. I was already mentally purchasing my millionaire lifestyle. It's quite comical when I think back on it. Boy, was I naive! Yet, unfortunately, this is how many people tend to think. There were so many factors I wasn't considering. First, I was looking at charts from a hindsight perspective. Of course, everything looks easy in hindsight. Second, I didn't factor in human emotion. This was a big one. Seeing negative or positive numbers flash across your computer screen can affect your decisions. It might bring on unnecessary anxiety or cause you to panic. Third, there are so many unknowns and variables. Such as: Is the company going to exceed projected earnings? Is the company being sued? Has Warren Buffett acquired a large stake? Did a drug trial fail? Is it an algorithmically traded stock? Is the economic data going to be good or bad? And on and on. I could come up with an endless number of possibilities that on any given day might affect an individual stock or the market in general. I don't think people realize how hard it is to predict the movements of the market and how much brain power must be expended daily just to survive in this game. In a previous blog, Data Over Emotion, I discussed how the direction of stock prices can cause us to become biased, overly excited, or fearful. When a chart is looked at in hindsight, it makes us believe things are easier than they truly are. I know in the beginning I fell victim to this bias. I was looking at charts, marking where I would have bought and where I would have sold. However, could that have been done in real time? Possibly. But probably not. 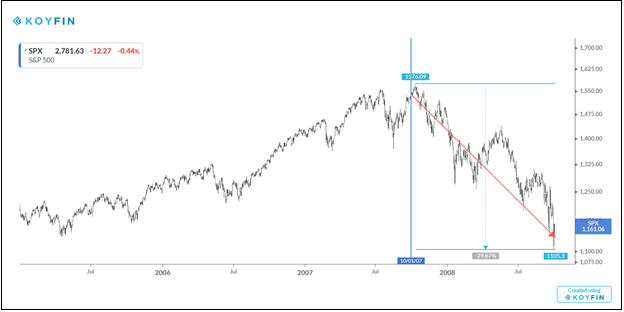 Let's look at a few sections from the historical charts of the S&P 500 and see if we would have been able to tell the future direction based on price alone, as we see it within a given time frame. The reason I'm using the S&P 500 instead of an individual stock is that I can't count the number of times I've heard people get excited based on financial news reports such as: "The Dow Crossed 26,000 Today!" or "The S&P 500 is at an All-Time-High!" It gets people excited and makes them want to buy. But does that mean the market will continue to rise? And the same goes for downward trends. I've removed the dates and all labels from the first chart in both sections below. I merely want you to see the direction the price has headed within a given time frame. Do you think the market will subsequently go up, down or sideways? Remember, we're trying to remove hindsight bias and look at it through the lens of how we would have seen it at that time. The chart above tracks the S&P 500 from January 2005 through October 2007. Now, if we fast forward one year and track the prices through October 2008, as illustrated below, we see where we ended up. The market plummeted, with a drawdown of more than -29%. Did you know in advance that all the bear markets would occur? I'm guessing not. I certainly didn't. With hindsight, everyone feels like they "woulda, coulda, shoulda" seen it coming. But that's highly unlikely. The time period illustrated above was from January 2002 through February 2003. Clearly the market was trending downward. 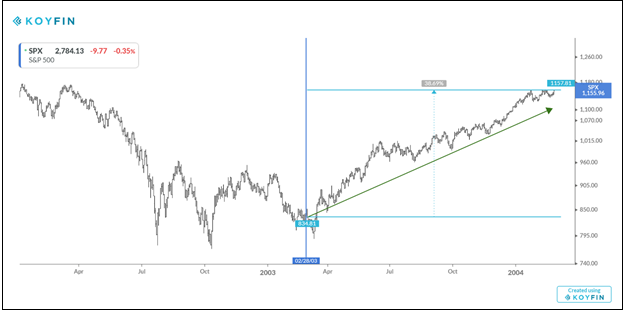 But if we fast forward one year and track the market through February 2004 (illustrated in the chart below), we see an amazing rally, with gains greater than 38%. 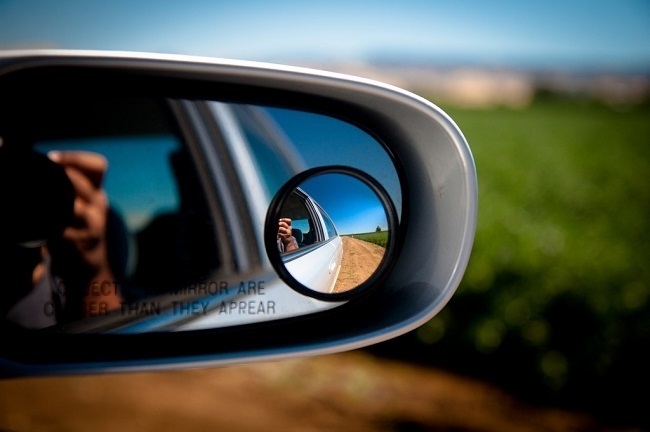 The beauty of hindsight is that it gives you a panoramic view. But that's also why hindsight is so misleading. Because in real time you have access to limited information. Yet from that limited information, you must try to predict the best future course available to you. And as the great philosopher Yogi Berra said: "It's tough to make predictions, especially about the future." If you would like to find out more, click here. The indexes mentioned in this communication are unmanaged and not available for direct investment. Past performance is no guarantee of future results. Opinions, estimates, forecasts, and statements of financial market trends that are based on current market conditions constitute our judgment and are subject to change without notice. We believe the information contained in this commentary has been obtained from sources that are reliable. This presentation is for information purposes only and is not intended as an offer or solicitation with respect to the purchase or sale of any security.